Today in Masonic History John "Ahyonwaeghs" Brant is born in 1794. 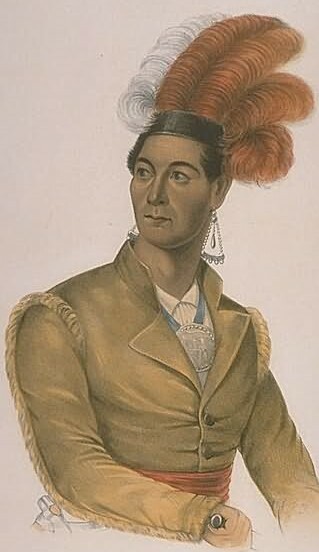 John "Ahyonwaeghs" Brant was a Mohawk leader. Brant was born on September 27th, 1794 near what would become Burlington, Ontario. In 1802, his family moved to the Burlington Bay area. He studied in Ancaster, one of the earlies English settlements in the area, and Niagara. The Mohawk tribe is a matrilineal society, meaning that inheritance of titles is determined by the Clan Mother, in this case, Brant's mother. From an early age, Brant was considered an obvious candidate for "Tekarihoga," the title given to the ceremonial, although not necessarily political, leader of the Mohawk tribe. During the War of 1812, Brant served in the Indian Department, a group of 100 officers designated to be liaisons with the local tribes. Brant led a group of warriors during the battle of Queenston Heights to stop an American attack. In 1821, Brant traveled with his uncle to England when they were informed that land granted to the Six Nations (in Canada First Nations) in the Haldimand Proclamation, a document granting lands to native tribes who fought with the British during the American Revolution, was not valid. Despite their efforts, the colony retained control of the lands that had been granted to the Six Nations. Brant encouraged the building of schools for his people. In 1828 he was appointed Superintendent for the Six Nations of the Grand River. In 1830 he was elected to the Legislative Assembly of Upper Canada (now the southern part of Ontario). He was the first Indian to sit in Upper Canada's Parliament. A year later his right to hold the seat was called into question became he did not hold enough lands in the area to hold the seat. He was removed from office and replaced. In 1830 Brant's mother declared him "Tekarihoga." Brant only held the office a short time. He passed away on August 27th, 1832 from a cholera pandemic. Brant was a member of Union Lodge No. 24 of Flamborough Village, then Dundas and Ancaster. He was elected Junior Warden of his lodge in 1819.